July 26, 2018, 2:00 p.m.
As Band-Aid approaches 100 years of tending to the nation&apos;s scrapes and cuts (Johnson & Johnson introduced the bandage line in 1920), the brand has more to celebrate than just a century of getting the job done. 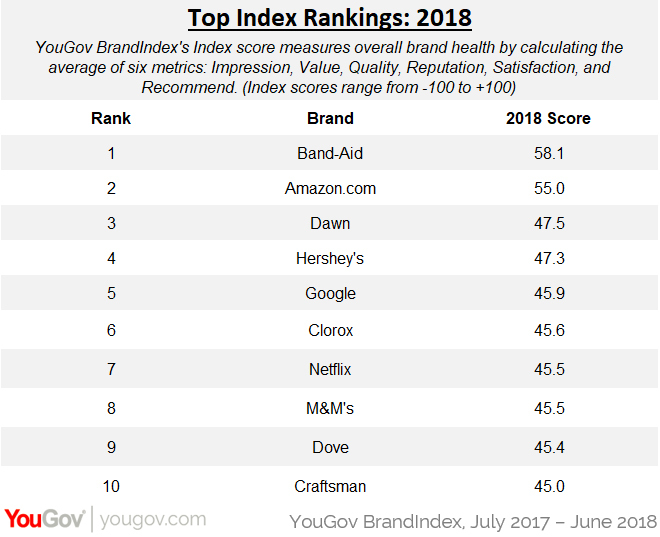 New numbers show that out of over 1,600 brands tracked daily by YouGov BrandIndex, Band-Aid is the healthiest in the eyes of American consumers. Indeed, this is the second year in a row that Band-Aid has claimed the title. 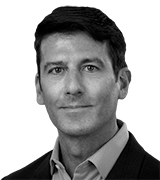 An annual review of Band-Aid’s Index score, which measures overall brand health by calculating the average of six metrics – Impression, Value, Quality, Reputation, Satisfaction, and Recommend – reveals that US adults give the product a score of 58.1. This is higher than other popular household consumer goods, such as Dawn (47.5), Clorox (45.6) and Dove (45.4), but also some of the biggest names in tech today, such as Amazon (55.0), Google (45.9), and Netflix (45.5). Chocolate brands Hershey’s (47.3) and M&M’s (45.5) also appear on the list of the country’s ten healthiest products and services, as does the tool line Craftsman (45.0), which was bought by Stanley Black & Decker last year. Noticeably absent from the list are restaurants, airlines, automakers, television networks, and apparel brands. Overall, this year’s collection of brands with the highest Index scores is largely unchanged from last year’s rankings. New to the list are Hershey’s, Netflix, and Dove. Gone from the top ten brands are YouTube, Lowe’s, and Quaker.